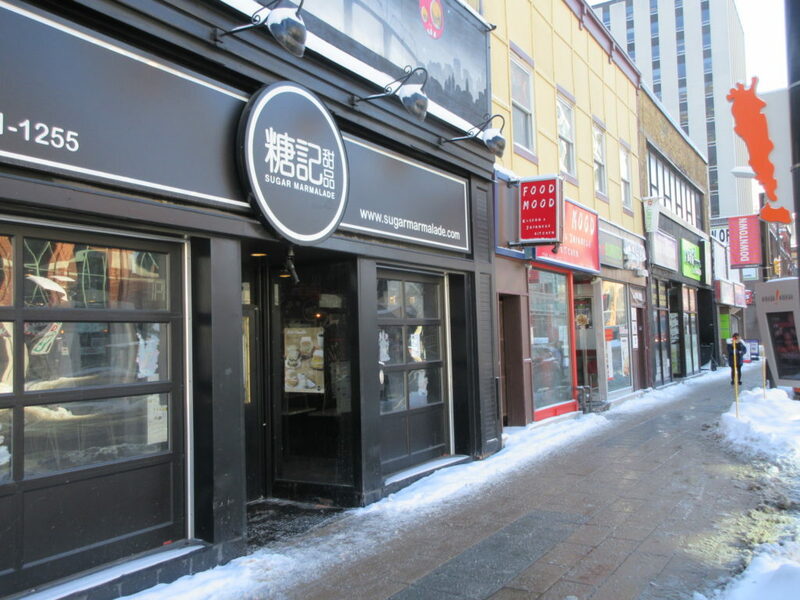 Over the last year, the block of Rideau Street between Dalhousie and Waller has welcomed a striking number of new Asian restaurants. If you stop to take a look, it’s hard to find a consistent theme in their menus, or the geographic origins of their cuisine. On the north side, Uji Café bills itself as Ottawa’s first Japanese café, while across the street Sugar Marmalade promises us “innovative fusion dessert” with the “classical taste of Hong Kong.” Next door, Shanghai Wonton Noodle makes no promotional promises but dishes out bowl after bowl of steaming soup and dumplings—no dessert course here! And literally sharing a doorstep with the noodle place is Food Mood, a tiny Korean place with a playful vibe. If these restaurants have anything in common, it’s their appeal to a young and hungry clientele. None of them is expensive, and they all offer minimal table service, with customers ordering at the counter or filling out a form with their choices. Each has something new to contribute to the food scene on Rideau. 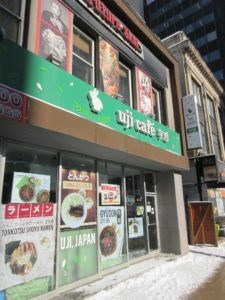 Uji Café, at 215 Rideau, had a “soft opening” that lasted several months, during which pastries and beverages were their only offerings. The café has a focussed selection of sweets; there are tarts, cake rolls, cheesecake and mille crepes—stacked crepes sandwiching a cream filling, sliced into wedges like cake. Each of these four basic items comes in three or four flavours; chocolate, mango, matcha or plain. You can get coffee at Uji Café, and also matcha, the ground green tea which makes a very beautiful latte, the foamed milk swirled into patterns on a bright green background. Uji Café has branched out into entrees in recent months, and you can now get a noodle bowl with Japanese curry or tonkatsu, a breaded and deep-fried pork cutlet. There are some burger selections which also feature the appealingly crisp cutlets on a bun with shredded cabbage and various sauces. These are a bit bulky for eating with your hands like a traditional burger, but even deconstructed and eaten with knife and fork, they are satisfyingly tasty. Uji Café is a comfortable space, with a variety of seating options including banquettes and armchairs, a cheerful spring-green colour scheme, and free wifi that seems to encourage many customers to settle in with friends and homework. Their tarts travel well if you want a dessert to take out, and we’ve found the chocolate ones to be a satisfying treat for two. Across the street, Sugar Marmalade at 180 Rideau St. also opened last summer with its dessert menu, which in this case goes on for pages and pages. There are some familiar possibilities here, such as waffles, millefeuilles and cheesecake, but also many choices that are new to the neighbourhood. How about Black Glutinous Rice with Durian and Coconut Milk, or Sweet Black Sesame Soup? There are many adventures to be had here in the form of new textures and flavours, and the vivid colours of green tea, mango, watermelon and other fruit make a feast for the eyes as well. Tucked at the back of the menu are some savoury snacks and entrees. This part of the menu is not very friendly to vegetarians, but several desserts, such as traditional tofu pudding with fruit or sweet red beans, sound nourishing enough to qualify as a guilt-free meal. In general, none of the desserts I’ve tried so far at Sugar Marmalade has been overly sweet, and all have been generously sized and fun to try. 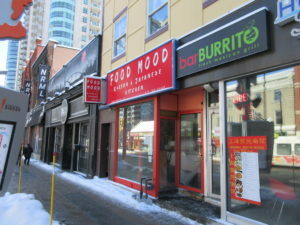 Shanghai Wonton Noodle at 178 Rideau St. is a very business-like little restaurant, in a long narrow space that it shares, oddly, with a burrito bar. Line up at the counter to order from a limited menu of soups, noodle dishes or dumplings, then pay and take a seat until your order is delivered, quite promptly, to your table. The broth accompanying the noodle soups is tasty, fragrant with star anise, and the pan fried wontons are savoury and satisfyingly chewy, accompanied by a little bowl of tangy dipping sauce. There are vegetarian options such as dry Wuhan noodles with tofu or a noodle soup with fresh Chinese greens. This is not a homey space; tables are small and close together, and there’s a bit of a chill from the front door. But if you’re in the mood for a quick, tasty and inexpensive meal you’ll find this place satisfying. Both Shanghai Wonton Noodle and Food Mood, right next door at 178B Rideau St., seem to be family businesses, with a young person working the cash register and an older couple cooking. The young woman who greets you at Food Mood is engagingly cheerful and welcoming, and one wonders if she decorated the place, with its quirky little tables made of thick slices of wood, the pink artificial flowers, and the post-it notes that paper the sides of the counter with affectionate remarks from friends and customers. “9A! 9A! 9A!” says one such note, apparently referring to a favourite menu item, and 9A is indeed very good, a sort of cross between sushi and cabbage rolls, each portion of rice wrapped in cabbage and draped with a piece of toothsome Korean-style pork and garnished with irresistible crispy bits, all very nicely presented on a long platter that barely fits on the table. There are also more traditional Korean dishes such as bibimbap and bulgogi, and there are many possibilities for vegetarians. The atmosphere at Food Mood, like its next-door neighbour, suffers a bit at this time of year from the chilly air that sweeps in the door with each arriving or departing customer, so you may want to consider take-out here.